This is my daughter Ava teaching me a very important lesson (yet again) with her child-like genius. 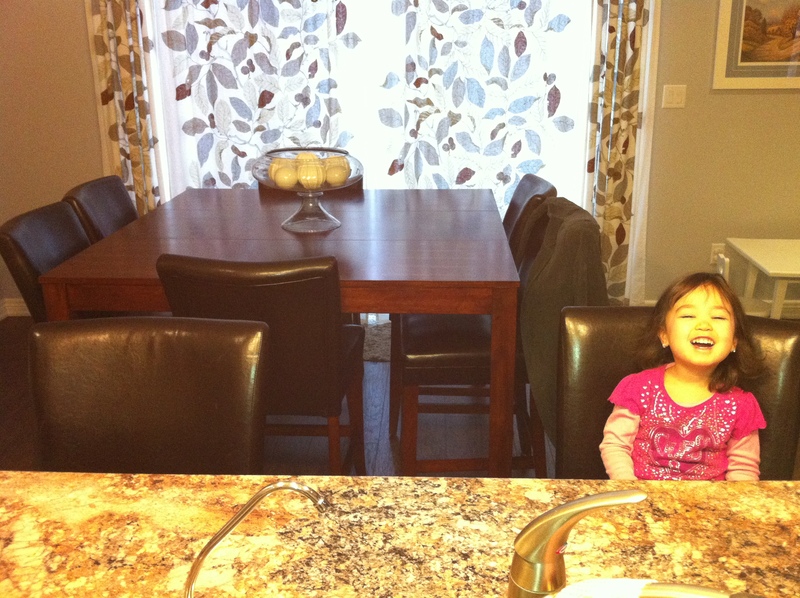 Last week, I was in the kitchen with Ava sitting at the counter having our usual father/daughter morning conversation. Ava started off sitting in the chair on the left as I was getting breakfast ready. However, the chair on the left is not her usual spot at the counter and she explained to me that she didn’t want to sit in “that” chair and wanted to switch. I automatically said, “Just climbed down that chair and climb back up the other one.” but Ava didn’t seem satisfied with my solution. Instead of taking my advice, she climbed up on the counter and crawled across the countertop to the chair on the right and sat down. My instant reaction was to remind Ava of the dangers of crawling across high places but afterwards, I thought about what she did and began to look at her actions in a different perspective. Ava is three years old. So to her, climbing up on the counter is a perfectly reasonable solution to switching chairs. In fact, for a petite three-year old, it is probably easier to crawl across the counter than it is to climb down her chair and climb back up the other chair. As an adult, I would have never thought to climb up on the counter and crawl across it to switch chairs. Why is that? Maybe it’s because I’d probably fall off and smoke my head off the edge OR maybe it’s because I’m an adult and I have preprogrammed perceptions in my subconscious mind telling me that crawling on countertops is inappropriate and dangerous. Do these preprogrammed perceptions embedded in my subconscious limit my ability to think creatively and outside the box? Ava is not limited by these perceptions (yet). To me, this was an excellent example of creativity and thinking outside the box. To her, this was a perfectly normal and reasonable solution to her problem. The reason why are children are entering kindergarten with genius-like skills is because they aren’t held back by downloaded perceptions that us grown-ups have of right/wrong, appropriate/inappropriate, good/bad, possible/impossible which are pretty well established. Children’s perceptions are not set in stone. For them, anything and everything is possible. Malcolm Gladwell, author of Blink, writes about the power of our subconscious and the impact that it has on our thinking and behaviour. Bruce Lipton, biologist and co-author of Spontaneous Evolution, states that 95% of our thinking and behaviours are controlled by our subconscious mind which is already established by age six. However, he also argues that the perceptions that are programmed in our subconscious can be deprogrammed. Lipton’s argument is very encouraging for the students that are currently in our education system. So what does this mean for us educators? How do we keep and develop the innovation, the creativity, the imagination in our students who are moving through our education system? We give them a voice and listen. We allow them to think and use their own invented strategies to solve problems. We guide them to think critically about their strategies and other students’ strategies. We let them be active-participants in their own learning. We learn with them as opposed to teach to them. We look for limiting perceptions that hinder and handcuff our students’ genius and guide them to the realization that they can succeed and that anything is possible. I went back to Ava that morning and told her that she used a very creative way of getting to the other chair that I hadn’t even thought of and that she taught me something new. She was so proud and gave me the biggest smile. It was a “Kodak” moment that was captured in the picture at the beginning of this post. I thought I’d leave you with an amazing video that also inspired this blog post.